There are many different ways to finance a new solar photovoltaic (PV) installation, with outright ownership and solar leasing being the two most popular. Let’s look at the pros and cons of each approach – and then discuss which option makes the most sense for you. 10 years ago, very few homeowners could afford to fully cover their solar installations out of pocket. The technology was simply too expensive, and the benefits were relatively limited. Rising solar panel efficiencies. Every year, panel manufacturers continue to push energy efficiency rates higher, making it easier for solar installations to generate handsome electricity bill savings for owners. Falling panel prices. In the past 5 years alone, solar panel costs have plummeted by more than 80% due to economies of scale and increased international competition (and have dropped 100 times over since 1977). This rapid decrease in solar panel costs have helped make the technology more affordable for millions of homeowners across the country. * Net metering – an arrangement in which the utility company credits your account for clean energy your panels feed into the electricity grid. If you consume 1 kilowatt-hour of utility electricity but feed 1 kilowatt-hour of solar electricity, your “net” energy bill is $0. * Feed-in tariffs – an arrangement in which the utility company pays you a premium for the clean energy your panels feed into the grid. With a feed-in tariff, it’s possible to generate positive cash flow from your solar panels. 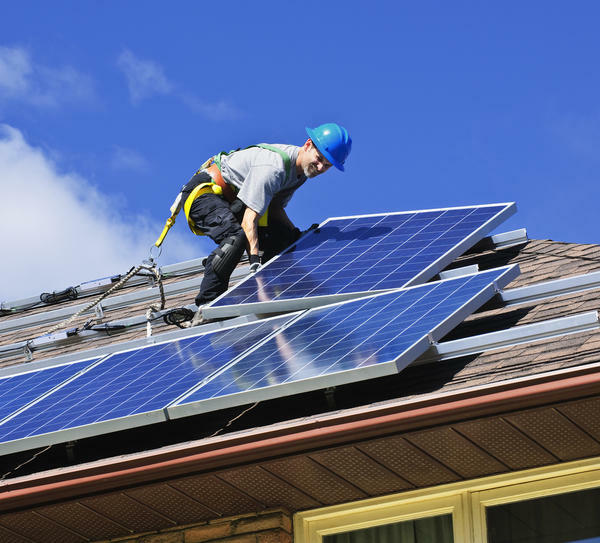 * Tax credits – you can deduct the cost of installing solar panels from your taxable income. * Solar rebates – you receive cash back from the government or utility for making a one-time investment in solar energy. * State renewable energy credits (SRECs) – your solar installation generates tradable credits that you can buy and sell on the open market. This represents another source of income generation potential. The benefits of outright ownership are straightforward. You receive (and own) 100% of the clean energy that your system generates. In addition, you also receive all applicable incentives. The main downside of outright ownership is that you’re 100% responsible for financing your system – including installation and maintenance. Even with bank loans, the cost of installing solar panels is still beyond reach of some families and businesses. Also, in some cases, a 3rd party solar company that sells you solar through a lease or PPA can take advantage of tax credits and incentives that you can’t take advantage of, and can thus offer you a better deal than you can get on your own. Enter the solar lease or power purchase agreement! Power purchase agreements (PPAs) and solar leases are relatively new financing options in which a 3rd party fully covers the cost of installing your solar panels — and charges you only for the clean energy that this system generates. In most cases, this new “electricity” rate is lower than what you currently pay your local utility company. And that rate is locked in for a set period of time, meaning it won’t change even if the utility company increases its electricity prices. The key benefit of solar leases and PPAs are simple — you pay $0 for installation or maintenance. The 3rd party system owner handles all of this — and you merely “lease” the installation. Furthermore, as noted above, the 3rd party solar company may be able to benefit from solar incentives for which you don’t qualify, and then pass those on to you. The downside is that you don’t receive any of the incentives that outright ownership brings. Instead, all applicable credits and rebates go to the 3rd party owner. Furthermore, at the end of the PPA period, you don’t own the solar power system. That’s a good question – and one that many homeowners answer incorrectly. They feel that their budgets are not large enough to fully cover the cost of installing solar panels, so they immediately go for the solar lease of PPA. What you should realize, however, is that about 97% of Americans grossly overestimate the true cost of going solar – sometimes by as much as $20k. Even with a modest budget, it often makes more financial sense to pursue outright ownership. This is why we recommend running a free solar report and requesting a free solar estimate. After an on-site inspection and careful analysis of your electricity bill, your solar contractor can recommend the best financing option for your property and budget. The results may surprise you.